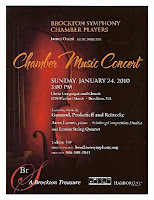 Chamber music, intimate and emotional, is the essence of civilized entertainment. On Sunday afternoon the Brockton Symphony Orchestra’s Concert Players delivered a perfect concert to a hundred music lovers at the Christ Congregational Church on Pleasant Street. Here in cyberspace I’ll tell you all about it. I’m going to have to pare this down to less than 300 words to qualify for publication as a Letter to the Editor in The Enterprise. I hope they’ll allow me to share these thoughts with their readers. Given our City’s image in recent newscasts, we need to be reminded that the sublime takes place here as well. Fifteen musicians performed, but there were never more than six players on stage for any piece, unless you count the pianists’ page-turners. We heard three pianists, and Dr. Mark Finkelstein played different instruments in two of the five pieces. Flautist Susan Caplan, like many of today’s performers a Symphony Board member as well as a player, introduced Charles Gounod’s “Petite Symphony” in four movements, written for 9 wind instruments. Today’s Jane Whaley arrangement featured Ms. Caplan on flute, Dr. Finklestein, oboe; Symphony President Torben Hansen, clarinet; Susan Winterbottom-Shadday, French Horn; and Stefan Sherwood, bassoon. The French Horn works overtime in the first movement, Adagio, Allegretto. The second, Andante Cantabile, features a beautiful flute melody, too complex to call pastoral but definitely idyllic. The third, Scherzo, was stirring as Rossini, and the fourth, Finale, was as symphonic as five wind instruments could be. It reminded me of Mozart, showing us what is possible. After the players left the stage, Symphony President Torben Hansen returned to introduce the next piece and its two extraordinary players. Antonin Dvorak based his “Sonatina for Violin & Piano” on American melodies. Mr. Hansen called it “a New World Symphony for violin and piano,” then introduced 12-year-old violinist Christine Hong and 9-year-old pianist Anna Larsen, who won honorable mention in the Brockton Symphony’s Feinberg Competition. There was nothing childish about the playing; each made her instrument sing for another four movements. The first, Allegro risoluto, was rousing with recognizable strains of familiar melodies. The second, Larghetto, moved from melancholy to playful interplay to the blues. The third, Molto vivace, was short, starting with a perky jig followed by stately dance images. The fourth, Allegro, began as an explosive celebration, then slow sweet textures, evolving into fast, then blazing fingers on strings and keyboard. They were thanked with a chorus of “Wow” and an enthusiastic standing ovation. Pianist Terri Ronan introduced Carl Reinecke’s “Trio in A major for Clarinet, Viola & Piano” explaining that they would omit the third movement, Legend. She was joined by Dr. Finklestein, this time on clarinet (he played oboe in the first piece) and Kathleen Kalogeras on viola. The Moderato, Allegro was all about tonality, with unusual chords and the melody passed back and forth among all three instruments. The beginning of the Intermezzo was focused on the piano, then the clarinet. Finally, as it began to seem it would be neglected, the viola came to the fore. The Finale featured more complex tonalities, not quite dissonant but attention-getting, then turned cheerful. At times the piano reminded me of Rachmaninoff, then turned soft to join the plucked viola to push the clarinet to prominence in a sweet conclusion. The last two pieces featured the "Blue Hills Chamber Players" piano quintet: Carol Chaffee on piano, Christine Nicholas and Carol Rankin on violin; Deyne Meadow, viola; and Susan Kenney, cello. Trumpeter Wayne King introduced Pietro Baldassare’s “Sonata No. 1 in F for Trumpet, Strings and Basso Continuo.” He described counterpoint, an important feature of this Italian Baroque form. The first movement, Allegro, was stirring with Mr. King’s brilliant “piccolo trumpet.” The second, Grave, was in D minor. Although minor chords usually evoke sadness, this was really very sweet. The third, another Allegro, presented incredible challenges to the soloist, and was impressively delivered. President/performer Hansen returned to the stage to introduce, and solo on clarinet in, Serge Prokofieff’s “Overture on Hebrew Themes for Clarinet, String Quartet and Piano.” We learned that Prokofieff composed it while visiting America in 1919. It was never performed in Russia until the 1970s and even then “Hebrew” was dropped from the title. Although, as an Overture, there were no movements per se, this wonderful piece was a wealth of sounds, moods and melodies. At times the six sounded like a small Klezmer band, at others a Hollywood soundtrack. I thought of the Electric Light Orchestra when they produced a most lovely effect from the vibrato of warbling strings. This piece, too, won a standing ovation. I was grateful to the Symphony organizers and the musicians, and also to be part of an excellent audience. Not only did they know that applause awaits the conclusion of a piece, not of each movement, but also to remain quiet and attentive throughout. And not a single cell phone was heard! This was a most satisfying afternoon.